The 2012 FORMULA 1 SINGTEL SINGAPORE GRAND PRIX is Singapore’s biggest outdoor entertainment event consisting of 6 stages across the Circuit Park, over 350 global entertainers and a fully packed 87-hour entertainment schedule. With just one ticket, fans can enjoy hours of track action complemented with world-class entertainment, at no additional cost from 21 to 23 September. Other than the full-scale mega concerts by music heavyweights Katy Perry, Maroon 5, Jay Chou, Noel Gallagher’s High Flying Birds and Bananarama at the Padang main stage in Zone 4, ‘80s iconic acts Bananarama, Pretenders and The Proclaimers will also perform full sets at the Esplanade Outdoor Theatre in Zone 4 and Village stage in Zone 1. In addition to these concerts, there will also be a myriad of theatrical productions, spectacular visual installations, and roving artistes adding to the festive atmosphere at the Circuit Park. Here is a preview of the diverse range of entertainment you can catch over the race weekend. Look out for United Kingdom's award-winning virtuoso musicians Fuse whose performance is as astounding as their world-exclusive Swarovski crystal electric violins, worth over one million pounds each. One half of the duo, Ben Lee, has won the Guinness World Record four times as the 'Fastest Violin Player', with a record of over 15 notes per second. The night would not be complete without the charm of Australia’s quick-change artistes Soul Mystique who are able to complete 22 costume changes in less than half an hour! This duo has been approached to co-produce the visual entertainment for Andy Lau, Cirque du Soleil and even the Fashion Week in New York, London and Paris. Regarded as the Jimi Hendrix of the Kora – a traditional harp-like instrument with 21 strings -, Grammy-nominated singer-storyteller N’ Faly Kouyaté’s performance will transport you to the undulating plains of Africa with his evocative tribal rhythms. Be transfixed by 2006 BBC World Music Award’s Best Newcomer nominee Dobet Gnahoré, a Pan-African singer-dancer-percussionist who sings in more than eight languages and has received a joint Grammy Award with American singer-songwriter India-Arie for the song ‘Pearls’. Tapping out intricate rhythms on a hand percussion, Dobet’s expressive dance and riveting voice makes for a spellbinding performance. Australia’s most prolific vocal percussionist Tom Thum can pretty much mimic any sound such as turntable scratches, helicopters, and yes, the roar of Formula One engines. The beatboxer from Down Under has been voted Australia’s best four years in a row at the OzHipHop Awards and has also won the Team Battle at the Beatboxing World Championships. Tom, who is part of the internationally touring production Tom Tom Crew, will collaborate with Singapore’s pioneer beatboxer Dharni for one of his sets on Saturday, 22 September. What happens when you pair a Kiwi and French artiste together? The Mamaku Project is a brilliant collaboration between bilingual vocalist Tui Mamaki and multi-instrumentalist Monsieur E. With a musical style influenced from Europe and the South Pacific, the group’s unique brew of world music is medicine to the soul. Sassy singer-songwriter Mama Kin is a delight to watch on stage as she belts out bittersweet tunes accompanied by stomping piano beats. She is a favourite at international music festivals from Woodford Folk Festival to WOMADelaide and Byron Bay Bluesfest. Cafe Rumi from Indonesia will have you mesmerised by their graceful Turkish dance form. Part of a Sufi order founded by the followers of Persian poet Jalaluddin Rumi, these Sufi dancers practice the ancient tradition of whirling as a form of meditation since the 13th century. Bringing the event closer to home, Singapore GP has put together the biggest line-up yet of local artistes comprising indie favourites and up-and-coming stars this year. Look out for Rebecca Burch and Alfred Chen, ShiLi & Adi, The Redtail Cats, Dharni, Vox, Indigo and crowd favourites Urban Drum Crew and Bloco Singapura. When it comes to accessorising a 686,609sqm Circuit Park, planting 10,800m of fencing and installing 1,500 lighting projectors are but just the beginning. For its fifth edition, Singapore GP has called on some of the most celebrated artists to create visual feasts across the Circuit Park so that patrons are treated to a multi-sensory experience from the moment they enter the gates. Four specially commissioned graffiti artworks by local interdisciplinary artist TR853.1 and his partners Clogtwo, Skope and Slacsatu will be displayed under the Bay Grandstand (Zone 3). One of Asia’s most sought after street artists today, TR853.1, also known as Sufian Hamri, is a recipient of the Goh Chok Tong Youth Promise Award - the highest honour ever bestowed on a street artist in Singapore. A master of visual illusion, pop-surrealist artist Leon Keer has produced larger-than-life 2D and 3D street art throughout Netherlands, Germany, France, America, United Arab Emirates and Australia. Once, he was arrested for an unauthorised painting on a street in Europe but was quickly released back to his artwork at the public’s demand! 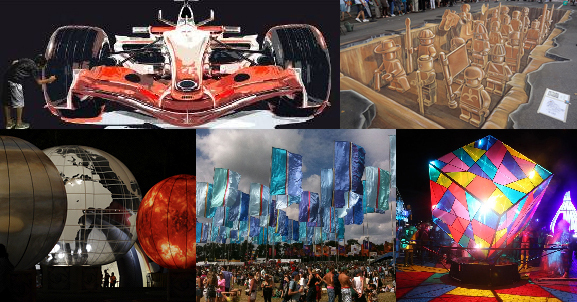 The Dutch-based artist will have an artwork ready for patrons to admire at the F1 Village in Zone 1 and will work on a second artwork ‘live’ over the race weekend. The Colour Cubed, which comes from Australia, is a mesmerising visual art installation. Patrons can rotate the six-metre tall illuminated cube to move the striking array of geometric formations in a kaleidoscope of colours projected around a 360 degree radius. Don’t forget to bring a camera to capture this marvellous display in Zone 1! Let your imagination take flight with Angus Watt – The Flags from the United Kingdom. Angus Watt’s flags have graced festivals all over the world, including the Glastonbury Festival, the Wellington Arts Festival and Womad Sri Lanka’s Festival of Drums. Adorned with geometric shapes and colours, these 60 multi-hued banners are visual treats for creative souls! The flags will take pole position in Zone 1. Over at the War Memorial Park, journey through the La Terra Al Centro Dell’ Universo – a recreation of 10 planets based on actual NASA imagery, making its debut in Zone 4. The largest planet hovers at 5 metres tall. Feast your eyes on a six storey high ‘Ballerina’, the ingenious backdrop of a French aerial dance group. The Ballerina is specially brought in as a collaboration with Italy’s Carnivale di Viareggio. The 2004 winner of the renowned festival features a paper-mache marionette with aerial performers executing gravity-defying dances in a performance themed La Sens de la Vie (the meaning of life) at the Padang in Zone 4. Keep a look out for roving performers La Valse decked out in grandiose costumes and doing what seems impossible – the waltz on stilts – in Zone 1 and Zone 4. With the dust settled on 11 races so far, a total of seven different Grand Prix winners from five different teams have made this Formula One season the most exciting yet. The position of Singapore as the 14th race on the championship calendar also means there will be an intensive battle to close the gap between the drivers in the race for championship points. Look out for fireworks lighting up the night sky after the chequered flag is waved! On top of Formula One, three other top-line motorsports series will hit the Singapore street circuit this year, providing over 12 hours of racing action from over 100 of the world’s finest racing cars. Making its first visit to the Marina Bay as their finale to the season is the GP2 Series, which in its seven seasons has proven to be the category of choice for future Formula One stars, including Formula One World Champion Lewis Hamilton. The Ferrari Challenge Trofeo Pirelli will bring the unmistakeable sounds of Maranello to the Far East for the first time too, with their Asia-Pacific championship-closing round. Back for its fifth visit is the Porsche Carrera Cup Asia where over two-dozen 911 GT3 Cup cars will be contesting in the 10th season of this immensely popular one-make category. Tickets to catch the thrilling track action and spectacular entertainment are available from S$58 for a Friday Zone 4 Walkabout ticket to S$1,288 for a three-day Pit Grandstand ticket (subject to availability). Tickets are available for sale online at www.singaporegp.sg, via the ticketing hotline +65 6738 6738 as well as at all authorised travel agents.